If you’re a standing desk user who wants to take your office fitness game to the next level, try one of iMovR’s state-of-the-art treadmill desks. Our ThermoTread GT is one of the quietest treadmills on the market, making it an unobtrusive addition to the office. 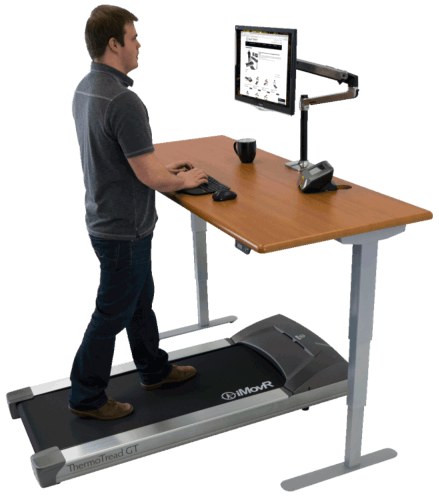 In fact, it’s the world’s first treadmill designed from the ground up for office use. And instead of burning out after sustained operation like competitors, it's backed by an industry-leading warranty on motor and parts. Our experts are here to help you make the right decision for your specific situation—call us at 888-208-6770, or start an online chat with a live product specialist.